It seems that everywhere you turn, health and wellness experts are telling you to eat more fruits and vegetables. You totally get it, and you know that fruits and vegetables are important! Yes, if you eat more fruits and vegetables you’ll probably live a longer, healthier life. Not to mention they’re protecting your body and mind from just about every chronic disease out there. Yes, eating more vegetables can help you maintain a healthy body weight, and even lose some fat (as long as you don’t bread and fry them or cover them with cream sauce, that is). That’s what most people struggle with when it comes to eating fruits and vegetables – how do you actually get it done every day?! As an Integrative Dietitian, I work with people every day who know they should make healthy changes and eat more fruits and veggies, but just don’t know how to do it. And as someone who’s spent a great deal of time figuring out the most effective ways to make those healthy changes, I’m chock full of amazing, creative and delicious ways to help you eat more fruits and veggies. Now let’s dive into my helpful ideas on exactly HOW to add more fruits and vegetables to your diet. Sneak Them into Other Dishes. Add ½ apple, a small handful of spinach or kale, or extra berries into your smoothie. 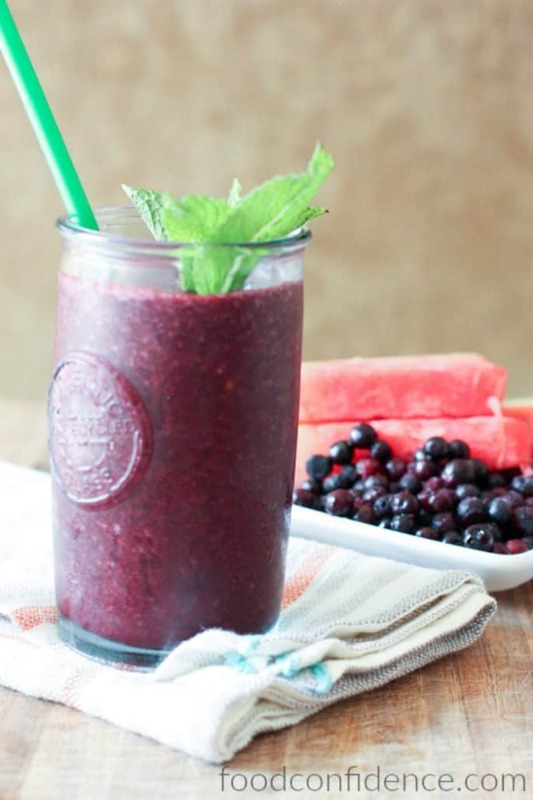 My Watermelon and Wild Blueberry Smoothie tastes like a sweet and refreshing slushie, but is chock-full of fruit! Mash a banana or shred an apple into your bowl of oatmeal to sweeten it naturally and sneak in some extra fruit! Shred carrots, zucchini, or cauliflower into your soup – the small bits add lots of veggie volume without changing the flavor or texture too much! Making stir fry? 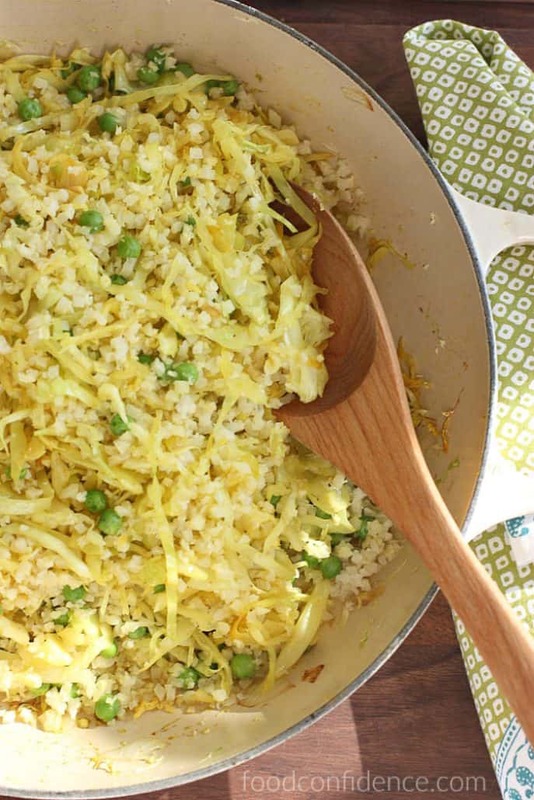 Sub out the rice with cauliflower rice for an added veggie boost. Love sandwiches? Switch out the lettuce for spinach and add an extra tomato. What about chicken, tuna, or salmon salad? Dice up a stalk of celery and throw it in, then add even more crunch with shredded carrots or broccoli slaw. Used to having a small salad on the side? Opt for a larger one and add filling toppings to make it your full meal. Making tomato sauce? Add in some extra mushrooms or peppers for a flavor boost and extra veggies. 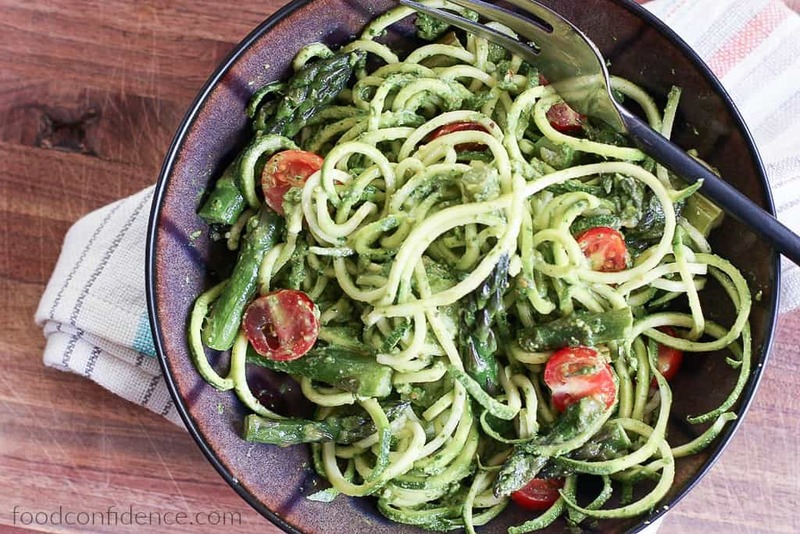 Mix spiralized zucchini noodles in with regular spaghetti for extra veggies that go unnoticed! My Spiralized Zucchini Noodles with Spinach Pesto is one of my most popular veggie-noodle recipes that’ll make you forget you’re eating veggies! Make Them Taste Really, Really Good. It’s no surprise veggies are often the last thing left on your plate when they’re bland and mushy – not even a veggie-lover wants to eat boring veggies! The thing is, you CAN make veggies taste really, really good if you know what to do with them. Roast a mix of veggies that have similar cooking times (like broccoli and cauliflower, or carrots and sweet potatoes). Roasting veggies brings out their natural sweetness and gives them a satisfying crispy, caramelized texture. All you need to do is toss them with a drizzle of oil and a pinch of salt and pepper, toss them in a hot oven, and enjoy. 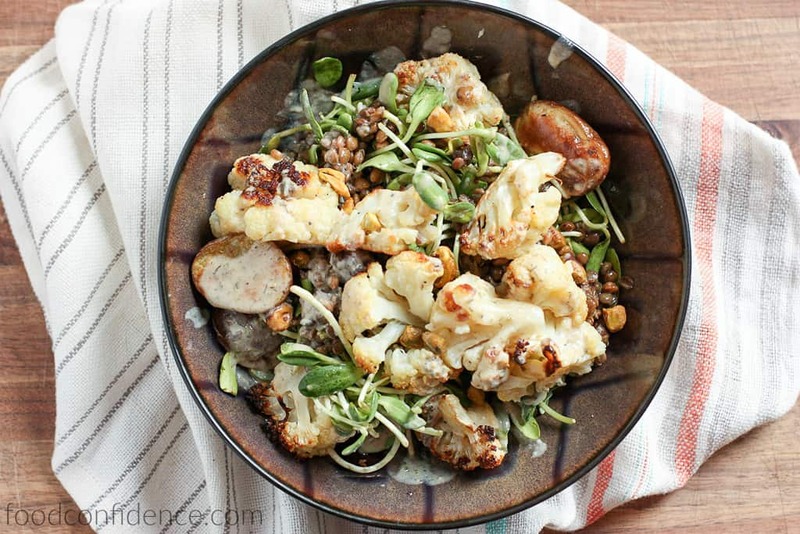 My Roasted Cauliflower and Potato Salad is full of flavor, making veggies actually enjoyable! Use veggies as your sandwich “bread” by making a lettuce or collard wrap. The filling is usually the most exciting part of a wrap anyways, so you’ll still be enjoying your favorite flavorful sandwich – just with some extra veggies. Don’t be afraid to spice them up! Try sauteing them with a drizzle of oil, then add on just about any seasoning you’d like – bland veggies aren’t healthy if they never even make it into your mouth. I like adding my trifecta of spices: chili powder, turmeric and cumin, but black pepper, rosemary, and ginger are great, too. Heck, even garlic powder can make a big difference in taste! Also, try my Curry Cabbage and Cauliflower Stir Fry. Skip the crackers and cheese and pair apple slices with cheddar instead. You still get the satisfying crunch, and the sweet and salty combo is seriously delicious. Ditch the chips and dip – Instead try crunchy raw carrots, celery, broccoli, cucumber slices or cauliflower with a dip like hummus, guacamole, or salsa. Love sweetened yogurt? Buy plain to avoid all the added sugars and artificial flavors, then mash fresh berries into it. Take two of these suggestions and try them tomorrow. Just add two more fruits and veggies to the number you’re at today. Really, just two more – you can do this! If you’re not an instant fan, well, try again. Research shows that sometimes it takes our taste buds several tries before actually beginning to like a new flavor. Be patient with yourself, you might just find some new faves. Let me know how it goes and what your favorite ideas are in the comments below! Danielle Omar is an Integrative Dietitian, Nutrition Consultant and founder of FoodConfidence.com, where she helps readers confidently manage their health and create food confidence. She’s also the founder of Nourish: 21 Days of Clean Eating, an online group wellness program that helps participants make lasting lifestyle changes so they can be their healthiest selves, and Nourish For Life, a comprehensive 12-month group coaching program offering lifestyle practices to further promote self-motivation and the routine behaviors that keep us healthy. Keep up with her blog for great health tips, nourishing recipes, and more! Find Danielle Omar on Facebook / Pinterest / Instagram / Twitter and say hello!